Date Palm trees are one of the Middle East’s most ancient fruit trees—remains have been found from 4,000 B.C.! Date palms love the heat and grow well in desert oases. There is a proverb that the ‘date tree has it’s head in the fire [sun] and it’s feet [roots] in water’. The palm tree or palm branches are mentioned 45 times in the Bible. The Hebrew name for the date palm is “Tamar” and this was (and is) is popular female personal name. The date palm was used as a decorative motif in Solomon’s Temple, in Synagogue decoration, and on coins (as an emblem of victory). 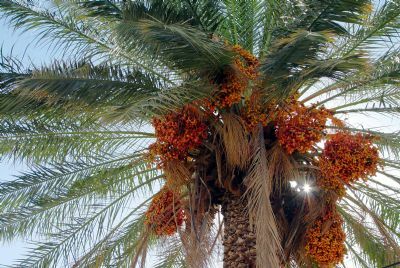 The Romans used the date palm as a symbol of the captured province of Judah after their victory over the Jews in A.D. 70.